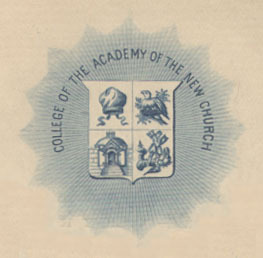 The College Letters—which are preserved in the libraries of the Academy of the New Church—were a mode of circulating information and opinion among Academy members for a period of about ten years in the late 19th century. The Letters were mailed to members individually. At this time there were various levels of membership in the organization: in these documents members are classified as Councillors, Collegiates, or Associates. U1. = Swedenborg Library: Vault: Unbound set #1 NCCL College Letters (unbound set) A.N.C. q S6 Ac1 cop. 4. No barcode. U2. = Swedenborg Library: Vault: Unbound set #2 NCCL College Letters (incomplete) A.N.C. 1886-1888 (incomplete) No barcode. Note card attached says Missing IV Apr. 2 1887 V Oct. 31- 1887 Complete set in Archives note card is photocopied on final page of handwritten copies. Each Letter was given a number in roman numerals. The first four letters do not have the roman numeral system but by the fifth all consistently are numbered. In several bound copies of the letters the first four have had the roman numerals added. Many of the letters also have copy numbers in standard arabic numerals. These second numbers correspond to who recieved the copy of the Letter—though there does not seem to be a consistent number for each recipient. Philadelphia, March 30, 1886: 7 pages. Philadelphia, June 8, 1886: 6 pages. Philadelphia, August 15, 1886: 4 pages. Philadelphia, December 10, 1886=117: 10 pages. T: no. (penciled: IV), 4? Philadelphia, March 12, 1887=117: 9 pages. Philadelphia, October 22, 1887=118: 19 pages. Philadelphia, September 1, 1888=119: 30 pages. U2: no. VII, 8 To Edward S. Campbell, Esq., Collegiate. Philadelphia, December 12, 1890=121: 4 pages. Philadelphia, April 1, 1891=122: 4 pages. Philadelphia, August 12, 1891=122: 13 pages. Philadelphia, January 1, 1892=122: 4 pages. Philadelphia, June 30, 1892=123: 13 pages. Philadelphia, November 15, 1892=123: 21 pages. Philadelphia, January ___, 1893: 11 pages. L3: no. XIV, Hugh L. Burnham, Esq. Philadelphia, March 20, 1894=124: 18 pages. L3: no. XV, Bishop Pendleton, 707 Corinthian Avenue, Philadelphia, Pa.
Philadelphia, May 1, 1895=125: 6 pages. L3: no. XVI, 2 Rev. William F. Pendleton, 707 Corinthian Avenue, Philadelphia, Pa.
U1: no. XVI, 9 Rev. Fred E. Waelchli, Berlin, Ont. Can. Philadelphia, September 1, 1895=126: 9 pages. L3: no. XVII, 2 Rev. W. F. Pendleton, Huntingdon Valley Montgomery Co. Pa.
V1: no. XVII, 8 Rev. William H. Acton Glenview, Cook CO. Ill.
V2: XVII, 14 Rev. John F. Potts, Huntingdon Valley, Montgomery Co. Pa.
U1: no. XVII, 7 Rev. Fred E. Waelchli, Berlin, Ontario, Can.